What Does The EpiPen Price Hike Really Mean For Families? Thom speaks with caller Emma, who explains how much the Epi Pen price increase will cost her family and how that could impact low-income households. The pharmaceutical company Mylan has been making headlines in recent weeks for hiking the price of its life-saving EpiPen device by more than 450 percent. A report released this past June, however, notes that the company has made similar price increases for a number of its drugs: here. Why are EpiPens so expensive, and why is everyone so mad about it? 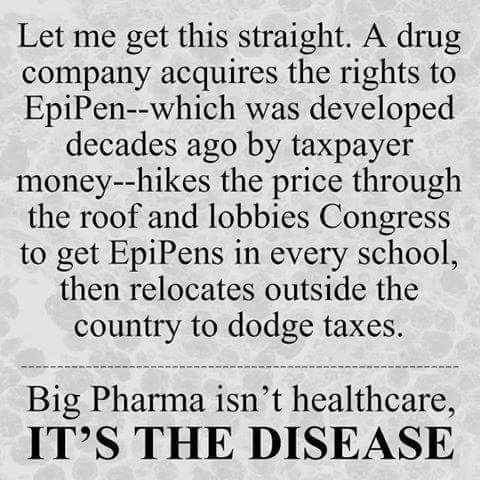 Why Did Mylan Raise EpiPen Prices 400%….Because They Could. This entry was posted in Economic, social, trade union, etc., Medicine, health and tagged USA by petrel41. Bookmark the permalink. Oh no. It’s already so expensive.